What the numbers from all the studies tell us is that nature-shaped forests are far more diverse woodlands than those manipulated by humans. The complexity of old-growth environments may turn out to be their most important attribute in terms of being self-regulating autopoietic forest systems. A couple weeks ago, my mother gave a short walking tour to a couple of guests who were seeing our woods for the first time. “It looks like something out of the Lord of Rings!” they exclaimed. I guess if you’re used to looking at younger forests, the portions of Plummer’s Hollow that have avoided lumbering since the mid- to late-19th century might look pretty impressive by comparison. Our forest doesn’t yet meet even the most minimal definitions of old growth — for example, a median age of half of the dominant tree species’ maximum longevity in the majority of stands — but it does exceed by several decades the average age of private or public forests in Pennsylvania, and is beginning to acquire a number of standard old-growth characteristics that add up, perhaps, to a general impression of enchantment. The older trees get, the more character they develop. And even apart from the age of its individual members (or at least their aboveground portions), a more mature forest is qualitatively different from a younger one. More and more species of lichens, fungi, insects and other key organisms form increasingly complex food webs. Though foresters are wont to think of old growth in terms of individual stands of large old trees, forest ecologists will tend to stress the age of the over-all forested landscape. The longer a forested landscape goes without being clearcut, or completely leveled by a catastophic disturbance such as a large tornado or a canopy-destroying fire, the more structural complexity it acquires. Icestorms, diseases, strong winds and insect invasions take their toll, while shade-tolerant tree species bide their time in the understory, waiting for a gap to open in the canopy. Young forests tend to consist of trees of just two to three species, all about the same size, and with very few rotting logs or standing dead trees (snags). In the northeast United States, natural stand-clearing disturbances are quite rare, but the dominance of industrial forestry has made this kind of forest the norm, and more diverse forests like ours the exception. However, it would also be very unnatural for extensive sections of a Pennsylvania forest to resemble Mirkwood in The Hobbit, or Fangorn in The Lord of the Rings. In J.R.R. 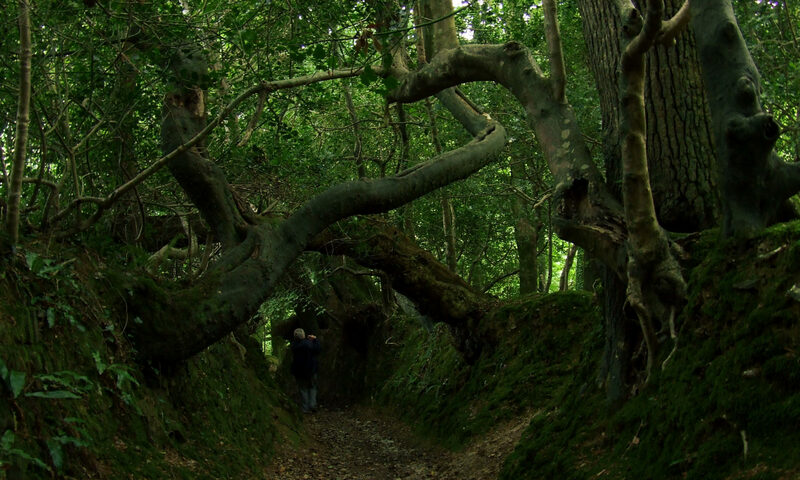 Tolkien’s imagination, an old forest seems to have consisted almost entirely of old trees, but in most places around the world, some kind of landscape-level patchiness would develop as various small-scale disturbances create openings of various sizes. The nature and frequency of these disturbances — what ecologists call the disturbance regime — is as important as climate, soil, and species mix in determining the character and compostion of the forest. Our over-riding management goal for the wooded portions of the property — close to 600 acres — is to grow an old-growth forest. But what will future old-growth look like? Chances are it will not resemble the forests that covered Pennsylvania in 1600 to any significant degree. Several species of keystone ecological importance are extinct, such as the passenger pigeon; regionally extirpated, such as the cougar and the gray wolf; or reduced to a pitiful remnant by an introduced disease, such as the American chestnut. Like most upland forests in the Appalachians, our mountain was once covered by these tall, slow-growing, long-lived trees; now their sprouts (as in the above photo) are lucky to reach 30 feet before succumbing to the blight. The loss of their nut crop — more copious and far more dependable than acorns and hickories — must’ve had a huge impact on many species of wildlife. And that’s just one example. Many other native tree species are falling victim to introduced diseases and insect pests, including dogwood, eastern hemlock, butternut, American beech, and various species of ash. The composition of the shrub and forest herb layers are changing dramatically as new, exotic plant species move in. The soil itself has been fundamentally altered in many if not most parts of Penn’s Woods, first by massive erosion following the wholesale clearcutting of the 19th and early 20th centuries, and then by acid deposition and, most significantly of all perhaps, the introduction of non-native earthworms. I’m increasingly reluctant to dwell on these issues with first-time vistors to Plummer’s Hollow, though, just as I haven’t blogged about them very much. I think it’s better to let people be inspired by a vision of something special and enchanted, even if that vision might seem a little naí¯ve, than to try and give them a crash course in unpleasant environmental realities. I do tend to stress the impact of white-tailed deer, because that’s something we have at least a chance of ameliorating, and our 15-year-old deer hunter program in Plummer’s Hollow is beginning to show some dramatic and positive results. For more on Pennsylvania old growth, see here. This was fascinating. I have a couple of questions. First, you suggest that Plummer’s Hollow is not old enough yet to be considered truly old growth. What is the minimum age, or is it more based on meeting a baseline of specific characteristics? And second, we’ve all read a lot lately about carbon offsets, i.e., paying for a number of trees to be planted that will ostensibly cancel out the damage one does to the environment via one’s consumption. Does this make any sense? In response to your second question, I’m not sure. I suspect that forest restoration could be a huge part of the puzzle, though. New research indicates that deforestation may be in fact the single largest contributor to global warming. Dave, this is all very interesting to me. Where I live(NW Iowa) there is a landform called the loess hills. Various groups have been working together to restore the lanscape. This means cutting down trees, controlled prairie fires etc. I have also been rereading some old Gary Snyder essays about the land, sacredness etc. I would very muckh like to visit your oasis someday! I’ve heard of that landscape — it sounds very beautiful. Native prairies are, of course, way more endangered than any forest type in the continental U.S., and I salute those who are working to restore them. You raise some very good questions! Thanks. I agree it sounds like buying indulgences, and that in any case the money would be better spent bribing countries like Brazil to protect and recover their forests than in planting tree farms. Only you could make me link up “beauty” and “grub,” Dave! I once got lost in the Joyce Kilmer National Forest “virgin” lands. And was much impressed both by the trees and the condition of lostness. Yeah, I’ve heard that’s a nice one. I haven’t been down there yet, but I’ve seen photos. Tulip poplar is an impressive tree when it gets old (well, at any age, actually). This is so intriguing. I never thought of forests as old or new growth. Now I’ll be looking to visit an old growth forest. Thank you. Hi Beth – I’m glad you found this interesting. Thanks for the reminder that these are not household terms – I tend to forget that. I’ve spent all day researching old growth forest info for a landowner client of mine (forestry firm). I’ll definitely be bookmarking your site as a source of knowledge for myself and the client. What I’m having a hard time finding are any recommendations, action plans or management techniques to enhance the old growth habitat. I know that older growth forests are especially intricate in structure and balance, so I’m trying to pool all resources I can find to ensure that my client leaves an old growth legacy. Have any helpful links in mind? Thank you for the fantastic site. Depending on the type of forest and its disturbance/management history, radically different strategies might be in order. For example, if you’re dealing with a white oak forest or post oak savanna, you’d probably want to look at prescribed burning. If you’re dealing with a forest that’s been badly infected with invasive plants, some sort of eradication program using Boy Scout volunteers and/or Round-Up might be advisable. Seeding and innoculation might be advisable to restore missing wildflowers or fungi, if relatively local germ plasm and undisturbed soils can be founnd. Our main management tactic here, as I think I mentioned in the article, has been whittailed deer population control through effective hunter management; the nuts and bolts of how to do that will obviously vary from state to state. I coined the phrase “autopoietic forest” after thinking about what distinguishes natural forests (systems) from MANaged forests (systems). Over the past several years I have given several multimedia presentations to clarify my views. The autopoietic forest is a forest that has resulted from the collective genetic wisdom of closely coupled biota with the environment, co-evolving. Autopoietic forests are dynamic, complex systems wherein the processes of the system are controlled/maintained by many species interacting with their environment. A MANaged system on the other had is one whose evolutionary trajectory has been disrupted and is now maintained consciously by a single species for the economic benefit of that species. These MANaged systems are greatly simplified and are managed according to linear cause and effect understanding generally referred to as “silviculture” or agriculture with trees. The problem with using the term “old growth forest” to preserve natural systems is that an old growth forest is simply a temporal snapshot in a shifting mosaic of vegetation. IF preservation is based solely on the defintion of “old growth” then I contend that it is inevitable that ALL old growth forests will eventually be disturbed and return to earlier successive seres disqualifying them for preservation. We need to focus more on the “autopoietic” nature of the forest. IF the forest is not being MANaged and is therefore regulated by natural processes resulting from the interaction of many species and the environment then we can say the system is “natural” and it is these autopoietic forests that should be set aside for preservation. Hi Dr. Beluzo – Thanks for taking the time to leave this comment. I am honored. I admit that in using the term “old growth” I am bowing to popular usage, whereas in fact I mean something more akin to “primary forest.” As I tried to make clear in my second paragraph, I don’t think the focus should be exclusively (or even mainly) on preserving stands of big old trees; we need to preserve and recover large, natural — or wild –forested landscapes. The problem is, as always, how to communicate the ideals that I think we share here, and I would suggest that’s something that ought to vary according to the audience. As you can see from some of the other comments here, I am not preaching to the choir: this is a general-interest blog, and these ideas are totally new for many people. I do like your application of autopoiesis to forest systems a lot — that’s why I included the Leverett quote — and agree that it helps refocus the debate in a very useful direction. But “autopoietic” is going to be a big, scary word to a lot of people. Incidentally, I also think the word “wild” accomplishes many of the same things, at least for the kind of non-scientific writing I do. I agee with Dave Foreman that wildness is a better way to talk about the ecosystem attributes we want to see than naturalness: the latter merely implies the absence of humans, while the former emphasizes the prevalence of larger-than-human realities such as natural disturbance regimes, large carnivores, and free-flowing rivers. “Wild” meaning “self-willed” and all that. I’m not a language purist, and I’m also not above using the language of managment to try and make points with those who assume that responsible land stewardship (another problematic word) inevitably involves management. There are people coming out of the forestry schools who are susceptible to persuasion on many of these issues, but we have to meet them part-way. I’m not willing to write them off, because many of them are people who genuinely love the woods. But they have also been, by and large, completely indoctrinated into the management ideology, and ideologies are tough things to confront head-on.